This dollhouse miniature Metal Kitchen Utensils is 1:12 scale and would make a wonderful addition to your dollhouse kitchen drawers. This 5 piece set includes a pair of tongs, an ice scooper, a small spoon, a medium spoon and an ice cream scooper. The longest measures 0.8" H x 0.313" W x 0.125" D and these are non-working utensils. 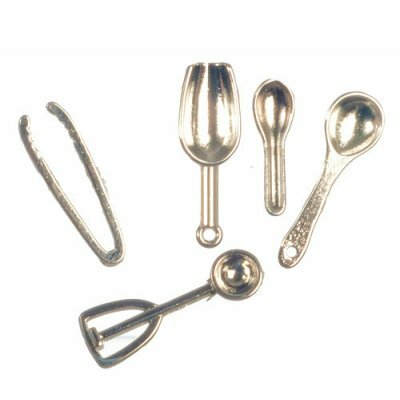 This Metal Kitchen Utensils - 5pc is supplied by Mary's Dollhouse Miniatures, which generally ships within 1 business day(s) of you placing your order .